Because it does not involve dental laboratory work, tooth bonding can usually be accomplished in a single visit to the dental office. Expect the whole procedure to take 30 minutes to an hour. First, we will clean the surface of the tooth to be bonded so it is plaque-free. We will then need to “etch” the surface with an acidic gel that opens up tiny pores in the surface. After the etching gel is rinsed off, the liquid composite resin in a well-matched shade is painted on in a thin layer, filling these tiny pores to create a strong micromechanical bond. A special curing light is used to harden this bonding material. Once the first layer is cured, another layer is painted on and cured. We will continue to build up layers until the restoration has the necessary thickness. We will then shape the bonding material using a dental drill to give it just the right form. Once we are satisfied that the tooth not only looks great but fits in perfectly with your bite, we will give the bonded tooth a final polishing. Bonded teeth should be brushed and flossed daily, and professionally cleaned here at the dental office twice per year, just the same as the rest of your teeth. The most important thing to keep in mind about caring for your bonded tooth is that composite resin can absorb stain, just as natural teeth can. Therefore, you will want to avoid smoking, red wine, coffee and tea to the extent possible. Also, while composite can darken, it cannot be lightened. So if you are thinking about having your teeth whitened, it should be done before your tooth is bonded so that a composite shade can be selected to match the lighter color of your whitened teeth. 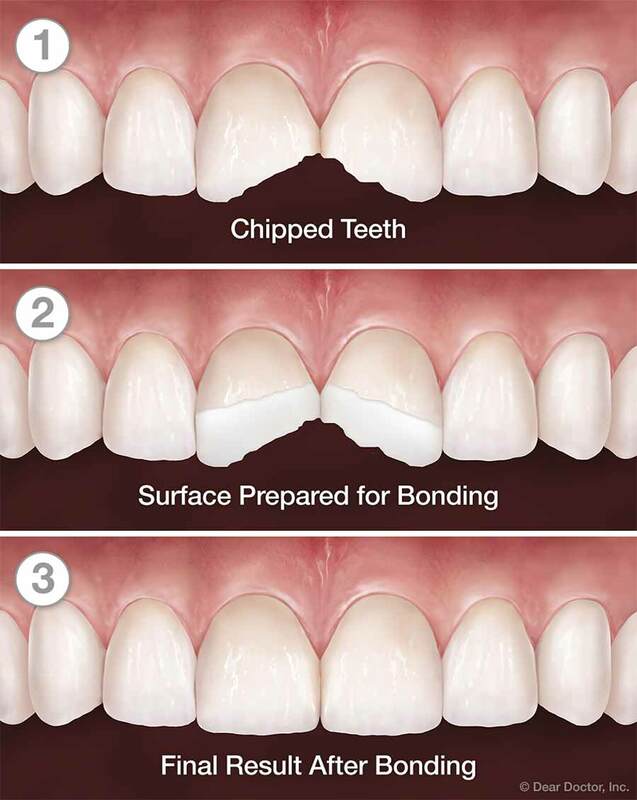 If you whiten your teeth after bonding, the bonded tooth may not match all the rest. Finally, try not to bite your nails, hold writing implements in your mouth, or use your teeth in other ways that could put excessive force on the bonding material and chip it. With proper care, a bonded tooth should stay beautiful for 3 to 10 years. Stanley R Beard DMD specializes in cosmetic dentistry & general dentistrythroughout the Jackson AL area. Areas we service include Jackson, Grove Hill, Leroy, Chatom, Thomasville, Millry, Wagarville, St. Stephens, Coffeeville, Gainestown, 36545, 36451, 36548, 36518, 36784, 36558, 36585, 36569, 36524, 36540 & all of Clarke County and Washington County.